The following article appeared in the December 2014 issue of Quadrangles, the University of Rhode Island's alumni magazine. The feature spotlights URI alumni who have dedicated themselves to helping others. Bethany Eisenberg was a nervous wreck a decade ago when she asked family and friends to forgo presents on Christmas and instead donate the unopened contents of their bathroom cabinets. “I didn’t know what to expect,’’ she says. Eisenberg was floored by the response: Great idea, and where can we put the boxes. The donations—infant Tylenol, diaper cream, vitamins—were packed into even bigger boxes and shipped to a hospital and orphanage in Guatemala that treats the poorest of the poor. That holiday campaign evolved into the Guatemala Aid Fund, a thriving nonprofit that has raised thousands of dollars to help children in a country where nearly half suffer from malnutrition and 75 percent of the people live below the poverty line. John Diego, 16, and Joseline, 14 are the two reasons Eisenberg is passionate about the country. She and her husband, Peter, adopted them from Guatemala City when they were babies, and during subsequent visits the harsh poverty the couple saw was wrenching. After the Christmas drive, Eisenberg thought she might be on to something: people would donate to a project that could show tangible results. Eisenberg soon figured out that it was costly to ship items and would be smarter to raise and send cash. Today, the nonprofit gives money to two small orphanages and a program called Happy Hearts that strives to keep fractured families together through counseling. She continues to ship medical supplies to Hermano Pedro Hospital and Orphanage in Antigua. Donations have an immediate benefit: $2,000 to two-month-old Andres for a hernia operation that saved his life; a refrigerator—the first—for the Luz de Maria orphanage and its 32 children; a yard at the orphanage for children to play tag; and new shoes for dozens of children, thanks to Massachusetts students who participate in Guatemala Aid Fund’s Caring Kids Club. Teaching young Americans that many children in other countries sleep six to a room on a dirt floor or don’t get new school shoes every year is an important part of the organization’s mission. 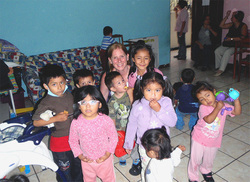 Bethany Eisenberg Zeeb at Luz de Maria Orphanage. The following article appeared in University of Rhode Island's CELS News on Dec. 18, 2012. 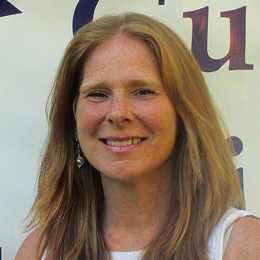 When Bethany Eisenberg Zeeb graduated in 1987 with a Masters degree from Natural Resources Science she not only embarked on a career to become a stormwater expert, she also came away with a deep commitment to community service. Thus it is not so surprising that today Bethany is the founder and president of the Guatemala Aid Fund which provides aid to children in that poor country.